Most physicians and dentists know that they should purchase an “own occupation” policy that provides disability benefits if they are no longer able to practice in their profession. True own occupation policies pay benefits if the insured cannot perform at least one of the material and substantial duties of his or her occupation. Some policies are also specialty-specific and further define “occupation” as the dentist or physician’s specialty. While true own occupation and specialty-specific policies were commonplace in older disability insurance policies, newer policies are substantially different across the board. 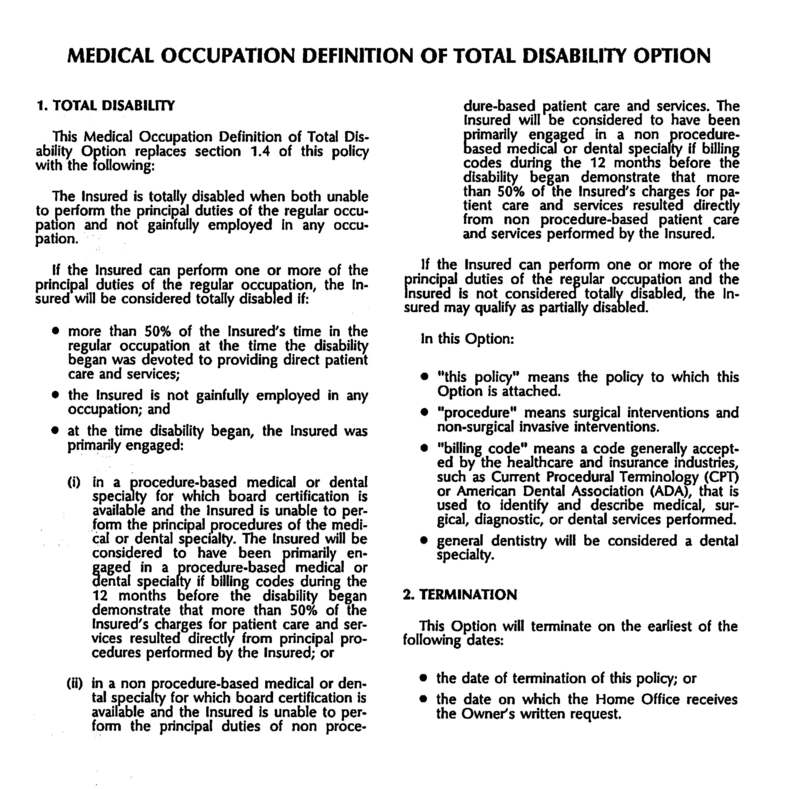 Over time, insurance companies have come up with several variations of the “own occupation” provision and these new provisions typically contain additional requirements and limitations that restrict coverage and/or make it much more difficult for professionals to prove they are totally disabled and collect benefits. This is something that not always apparent from the marketing and application materials provided when you are purchasing the policy. For example, a physician quickly reviewing a policy application may check the box for the “medical occupation definition of total disability” rider because it sounds like what he or she would want if he or she could no longer practice. It’s likely that the physician would just assume that this option is the equivalent of the true own occupation policy described above, and move on to the next part of the form without a second thought. However, if the physician never reviews the subsequently issued policy, he or she may be in for a surprise if the need to file a claim arises. In addition to this being a particularly confusing, complex total disability definition, this rider would also cost you higher premiums, without providing the disability coverage that you likely wanted. It is therefore very important to review your policy when it is issued, to ensure you have a complete and accurate understanding of the coverage that you are paying thousands (upon thousands) of dollars in premiums for, so that you have the disability coverage you need, if/when you need it.